NeoMAD enables applications for iOS to be built and simulated using the IPHONE, IPAD and IOS targets. The IOS target is used to generate applications compatible with both the iPad and iPhone devices. The build action can only be done in a Mac environment. On Windows, only the Xcode project will be generated. Developers will then need to move the generated project onto a Mac with Xcode to build the project. With Apple’s free developer account, binaries can only be built for simulators. Consequently, by default, NeoMAD will generate the simulator binary of the application. To generate the application for an ad-hoc (on a device for tests) or an AppStore deployment a charged developer account is required. The table below summarizes the differences between Apple developer accounts. This can be used to determine if a free account is enough or not. To enroll on a developer program, go to the developer portal. NB. To enroll on a charged program, developers first need to enroll on a free program. Accounts are nominative. Consequently, to subscribe to an organization program, it ideally is the team administrator who must register on behalf of the organization. The administrator linked with the main account will be the team’s “agent”. He/she will be responsible for enrolling the other team members and allocating roles within the team. For further details about available roles and their rights, please consult the member center portal (can be accessed only after subscription). Validation of registration for a charged account for an organization may take several days since Apple will contact it to validate the account information and to be sure that the person registering is an employee of the company. All other team members must have a valid Apple account (free). Invitations must be sent to members using the e-mail associated with their Apple account. The four first points can be done at iOS provisioning portal. The Certificate Assistant saves a CSR file to your desktop. It must then be sent to the mobile provisioning portal from the entry “Certificates > Development” and be approved by the team admin. The development certificate can then be downloaded from the portal. In order to be able to test an application on an iOS device, it must be linked with the development account. To register the device, its UDID must be uploaded to the iOS provisioning portal. The UDID is a 40 character string that is tied to a single device, similar to a serial number. The UDID can be found in iTunes when the device is linked to the computer. This UDID must then be entered in the iOS provisioning portal through the “Devices > Manage” section. For further details about how to find and upload UDIDs, please refer to the documentation under “Devices > How to” in the iOS provisioning portal. The App ID is the application’s single identifier. It consists of a unique ten character string called the “Bundle Seed ID” (provided by Apple) and a Bundle identifier. 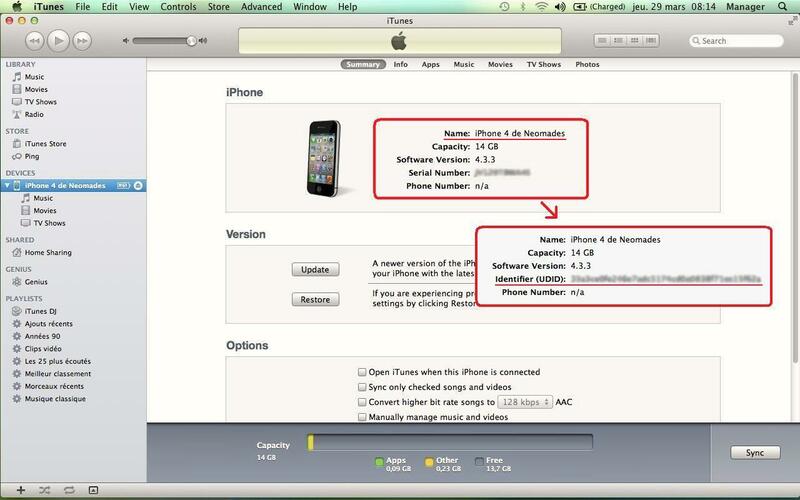 When NeoMAD builds an iPhone application, the bundle identifier of the generated application will be applicationidentifier as indicated in the URS file. Be sure to indicate this value when entering an App ID in the iOS provisioning portal. Remember that if the applicationidentifier parameter is not explicitly set, it will take the value of the packagename parameter. A description is required too, it will only be used throughout the portal to identify this App ID. For further details about using the AppID, please refer to the documentation under “App IDs > How to” in the iOS provisioning portal. The development provisioning profile is the collection of all the information provided above. It ties developers and devices to an authorized iOS development team and enables a device to be used for testing. It groups together the certificates, device UDID and App ID of an application. A list of devices on which the application will be tested (cf. Declaring a device for testing). The device is now ready to test the application. To distribute applications, a distribution provisioning profile is required. It will identify the developer or organization that provides the application. The following parts describe the process for creating the distribution provisioning profile. a charged Apple developer account is required. The process for creating a distribution certificate is the same as the Obtaining a development certificate process. Generate the certificate signing request (CSR) and then upload it to the provisioning portal from the entry “Certificates > Distribution”. The distribution certificate will then be created and can be downloaded from the portal. a development certificate cannot be used as a distribution certificate. The main differences compared to the development certificate is that only team agents and administrators can create the certificate. An organization can have only one distribution certificate (however, it can be deleted and replaced). Note that since the certificate is created with a private key, it cannot be shared with other users, except if the private key is shared too. This is explained in greater detail in the next section. To share a distribution certificate with team members, the private key of the certificate must be shared. Double click on p12 file. Keychain access should open. The distribution certificate can now be used with the second machine. The App ID created for development can be used to distribute the application. If the App ID was not created, please refer to the Creating an App ID section for development. The distribution provisioning profile will be used to sign the application. It identifies the application and the organization that distributes the bundle via its distribution certificate. The profile can be created in “Provisioning > Distribution” from the iOS provisioning portal. When creating a distribution provisioning profile for an application, the distribution certificate will automatically be associated with the profile. Only the name of the profile and type of distribution is required. Ad hoc: where a list of devices is required, the application can only be installed on these specific devices. NB. Only devices associated with the account can be selected. The application will not be visible in the AppStore. To build and test an application on a device, a development certificate and provisioning profile are required. Cf. Provisioning a device for development to create both. Download the development mobile provision from the iOS provisioning portal from the section “Provisioning > Development”. It is a .mobileprovision file. <ios certificate = "iPhone Developer: Durand Bernard"
Build with NeoMAD using the IPHONE target on the Mac where the certificate is installed. the xcodebuild command line tool must be installed to build the application. It can be downloaded and installed from Xcode in Xcode > Preferences > Downloads. to find the certificate name installed in a Mac, use the following command line in a shell: security find-identity -p codesigning -v.
The process to build an application for the App Store is almost the same as the process to build an application for a development device. Download the distribution mobile provision from the iOS provisioning portal in “Provisioning > Distribution”. Add the provisioning profile to the project. NB. since this file can be shared between team members, it is advisable to include it in the NeoMAD project. If you want to build on a different machine than the one used to create the distribution certificate, download the distribution certificate from the “Certificates > Distribution” section and install it by double clicking on it. The certificate cannot be used if the private key is not installed, cf. Sharing a distribution certificate to learn how to share the key. Fill in the signature section of the urs with the name of the certificate and path to the mobile provision file. <ios certificate = "iPhone Distribution: Neomades"
Check for the .ipa file in the out directory. This file cannot be installed on a device but can be sent to the App Store.